In the past, several famous athletes have snubbed President Donald Trump by declining to visit the White House after they were invited. But not Clemson Tigers Quarterback Trevor Lawrence. He had a much different reaction after spending Monday evening in Washington with the president. 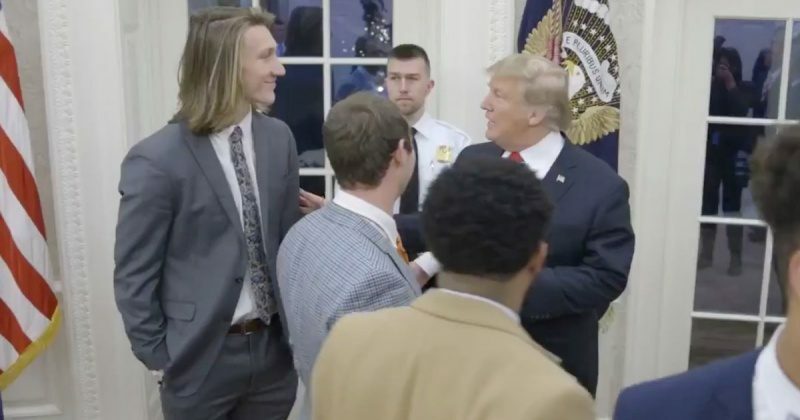 On Monday, President Donald Trump welcomed the Clemson Tigers to the White House to celebrate their win against the Alabama Crimson Tide in the National Championship game. Trump offered an “all-American” menu for the football players, serving up a full fast-food meal on silver platters which he paid for himself since much of the White House kitchen staff was furloughed. While this may not have been their nutritionist’s first choice, the football players had a ball dining on cheeseburgers and french fries with the president. Quarterback Trevor Lawrence, in particular, told TMZ that he had an “awesome” time and couldn’t wait to go back. Another NCAA championship team, the University of North Carolina men’s basketball team did not attend citing scheduling conflicts. Also, Trump hosted the Clemson Tigers, the winners of the 2016 NCAA football championship, at the White House in June. It certainly is nice to see such a well-mannered, talented young man with so much respect for the president. We don’t know Trevor Lawrence’s personal views when it comes to politics, and we shouldn’t have to. Whether you’re a Republican or a Democrat, you should be thankful for the once-in-a-lifetime opportunity to meet with the president at the White House, just like Lawrence was.